“Ultimately, the main problem with Detroit is that it's a ‘duopoly’ system where Xfinity and AT&T are the only realistic options for most people,” Zimmer wrote in an email. “We need to think about a public option,” Wiley said. “In absence of that, states and cities have to see it as Job One to create affordable access with more franchise agreements ... incentives to bring in more competition with more price points,” she said. "Both AT&T and Xfinity, the major internet service providers in Detroit, provide $10-per-month Internet plans for low-income families. But the less expensive Internet service is slow. " It states that 10MB is too slow. Are you kidding me?! I have ATT 10MB and it is more than sufficient. When does this non-sense end? Mark got the issue right. At the USD 10 you can do e-mail, ask Mr Google all kinds of questions, and access gov services! Higher speeds are needed only for gaming and watching movies. Not interest in paying for these with my tax dollars. No, it won't be the next civil rights issue because most people don't understand technology, how computers or the internet works, how streaming works. and will pay anything for comfort and convenience. The ISPs will be sure to give enough people what they want at an "affordable price" to forestall serious protest or opting out. After all, people today are paying $500. from scalpers for their kids' Xmas toys that retail for $59. In the suburbs there is another problem. I installed AT&T broadband April 1. I only get 25 MPS but pay for 50 MPS. AT&T will not or cannot upgrade the cable from my pedestal to the fiber node less than a mile away. Neil- I share your problem. I have 10 Mbs, but ATT offers now 25 MBS for the same price, but they cant speed it up at my home. Strange. As I said, I don't have issues with 10. Time was that many homes didn't have access to electricity, but public efforts changed that -- notably the Rural Electrification Administration, since absorbed into the Rural Utilities Service. If private companies won't offer service communities need, maybe we need a similar public program for universal connectivity. I'm fortunate enough to live in Marshall, which is now building a public utility called Marshall FiberNet. I hope we get a lot of company in other Michigan communities soon! The report gives the solution to the problem. Detroit and other cities should setup municipal Internet WiFi networks. Detroit should go to foundations for the money. WiFi is better than wiring the neighborhoods. "The problem is considered an equal rights issue by the city. Detroit officials expect to make an announcement in the first quarter of 2018 to recommend ways to help low-income residents get high-speed Internet." Mrs. Dawsey highlights yet another problem holding back Detroit's recovery; officials attempting to change the narrative by framing Detroiters unwillingness to pay for a service as a "rights" issue. If history is any indication, the soon-to-be proposed "solution" will somehow involve the government stepping in and subsidizing some aspect of it, all in the name of "fairness". The thing about history is it tends to be cyclical. "New" ideas are more often than not old ones with a different name slapped upon them to make them easier to peddle . I'd recommend reading some Frédéric Bastiat if anyone want to see how this will ultimately play out. I agree with Mark. Stop it. Everything is not an "equity issue." I use my phone for internet service, and run a business and my personal life through the same phone. Is it slower than broadband, of course it is. Is it far less expensive than satellite, our only other option, that is also true. Can we stream movies in high definition, no. So what!? Do I not update my apps and programs without hitting the library or a coffee shop with free wifi, yup, that's how it works. This is not being disadvantaged. Must everything be equal? I have areas in my house where I can not get cell phone service. Does that mean the government should provide me the upgrades necessary to get this service? Some have broadband service that is faster than what others have. Does that mean the government should provide the faster service to everyone? Or maybe, the government should take the faster service away from those who have it so that they become equal to those that have the slow service? How about cars. Some have brand new cars that provide reliable transportation, and if a car breaks down, they have a loaner provided from their dealership or their insurance policy. Others have unreliable "beaters" that provide problematic transportation at best. Should the government step in and equalize what everyone has in the name of equality? As a previous comment said, when does this non-sense end? A recent visit to Cuba, which has been a socialist state since 1959, and where everyone gets the same basic pay as everyone else, no matter if one is a doctor, a forklift driver, or even unemployed, has shown that the people do not like socialism. Those that can have found ways around the system to provide themselves a better income. Their way around the system is to educate themselves, always strive to better themselves, and get the extra money to provide the things in life that we take for granted. Ms. Dawsey might be better off writing about those that have certain things, and explaining to those that do not have what they need to do to achieve a better standard of living. Where in our Constitution does it guarantee to the poor, equality in all things achieved by people who have achieved more either in education, property, or finance? We are only guaranteed "equal opportunity" to achieve. Since the War on Poverty led by LBJ, the number of poor has not diminished. When the people refuse to finish high school and to utilize the advantages our country offers, the remaining populace is under no obligation to insure the resulting poor have individual access to the internet. The poor should go to the local library if they can't afford the internet to be brought into their "subsidized" housing, which is another sore point because those that work 40 hours a week in many cases do not reside in as nice housing as provided the poor. Sorry, but we provide enough funds to the "poor" already. By the poor I am not including those on disability or suffering from medical infirmities. Ms. Pratt Dawsey [Bridge], Detroit is the people not the problems, people that succeed need to have their how and why told so others can take their lessons and apply them to their lives. 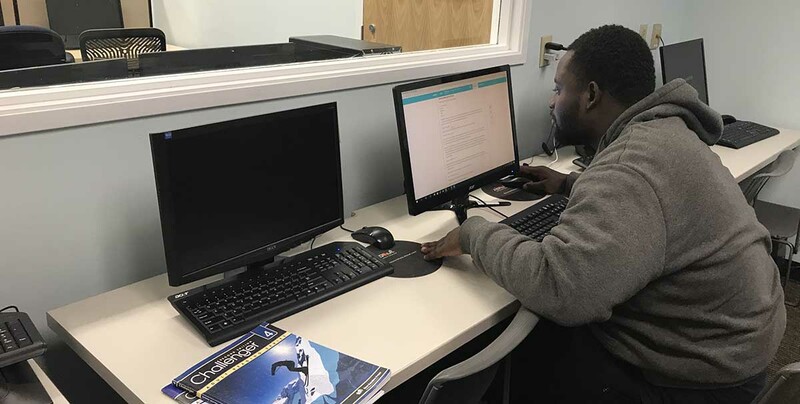 The article opened with the experiences of a young man that is succeeding, I would have learned more about how people are succeeding in Detroit, how there is hope in Detroit, by hearing about the why and how he is succeeding then about Detroit residents need to have high speed internet access provided for them. People know the problems, but hearing how others succeed in spite of those problems is how we change our lives and why we should be looking to others. I suspect my experiences focus me on the individuals making an extra effort that helps them succeed. The reality is that if you only look for the problems and the failures you only find the problems and reasons why people shouldn’t succeed. If you look for success you can find the how and why people succeed, and when you learn the why and how of success you can help others succeed. A year or so ago there was a Bridge story about a homeless student studying and graduated from EMU, there was enough in that story for others to learn how they can succeed. The young Mr. Coleman that you opened with seems another like story, why do you only see his challenges and not his success? The other part is that what you describe in Detroit is true across all of Michigan, in my relatively small town library has two dozen computer/internet stations and every time I go to the library they are always full. In our town when using the library the user has tech support at hand, someone who helps with online problems and who will help them to find what need. That personal support is extremely valuable. When you see someone going to such a center for access as a barrier, I wonder if you would have listen to the young man’s story and may have heard about the people there that have helped him, his success maybe more about their help than internet access. Thank you for the article and please consider pausing for a moment before starting the next article to wonder if there is someone in the article that other people could learn from if they knew the story, it is about people. After reading this article and while writing my comments I paused to think about Bridge and what it has meant to me, how I have learn others’ perspectives, how I have rethought my own approaches, how I have thought about how to articulate my perspectives. Thinking is always good for me, but then I thought about Bridge of late and how it seems to have changed, how the articles have a tenor or a focus rather than a catalyst for thinking. And this causes me to hesitate when deciding on a donation and if I don’t donate than I shouldn’t use the service. I will monitor my comments, to hear what others think for if someone reads and offers their thoughts then they deserve to be listened to and the only way to show you are listening is offer your thoughts in return. Thank you Bridge for the platform for readers to comment on, good luck in the future, I encourage Bridge staff rather than talk at readers recognize their collective intelligence and try to harness it for innovative ways to addressing issues you find important. This has to do with net neutrality; everyone should have equal access and not be able to pay for faster or more data. In the opinion implied in this article that means everyone gets equal dial up service. After all, why would the ISP be motivated to increase or improve his offerings? The reason Detroit and other urban and rural areas across the US have terrible, or no access to the information superhighway, is because political leadership has not demanded it. Comcast, AT&T, Verizon and Charter do an excellent job of protecting their monopolies by crippling the political process with vast sums of political campaign money at the local, state and federal levels. Everyone needs hi speed (GIG-fiber) low cost access to the information superhighway, just as much as we all have access to our freeways, water, police and fire, k-12 education and emergency medical. It is an absolutely critical essential service. It can happen, as it already has in so many of our global competitor nations and, quietly, even in several communities here in Michigan and across the US. But it must be demanded by the people of their political leadership who in turn, must reject the cash enticements of the industry. Bonding is available to pay for it at the municipal level. We are doing it successfully. There is no legitimate reason it cannot be done in your home town as well.